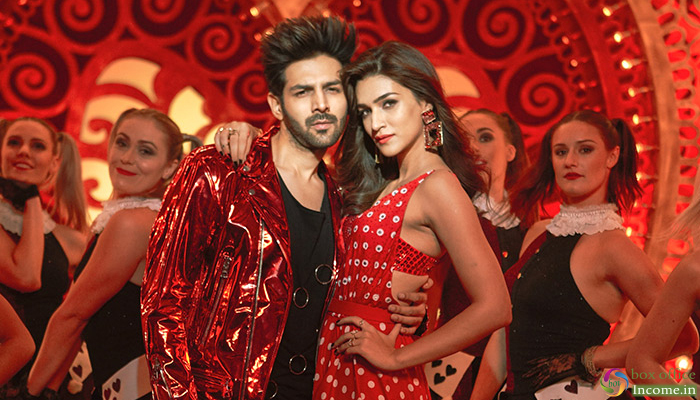 Laxman Utekar’s romantic comedy flick ‘Luka Chuppi’ starring Kartik Aaryan, Kriti Sanon and Aparshakti Khurana has been on a roll at the box office ever since its release. The film has entered its third week and is still giving a tough competition to the newly released films. The film has been liked by the audience and the critics too have praised the equation between the leading stars of the film. Kartik Aaryan, Kriti Sanon, Pankaj Tripathi and Aparshakti Khurana’s comic timings and their camaraderie have been the high point of the film. After a solid opening, the movie remained strong throughout and did the business of 53.70 crores in the opening week from 2100 screens across India. In the second week also, it maintained a strong pace and collected 21.54 crores at the domestic box office. Then in the third weekend as well, Luka Chuppi recorded good occupancy across the country and bagged the amount of 7.27 crores that included 1.62 crores of Friday, 2.25 crores of Saturday and 3.40 crores of Sunday. Now once again the movie has entered in weekdays and as usual started getting lesser footfalls in theaters due to normal working days. Still Luka Chuppi managed to stay good on 3rd Monday and minted the amount of 1.33 crore. With this, its 18 days total domestic collection has become 83.84 crores.